It is being hosted at a private residence in Hartsdale, NY. This seminar is offered as part of the charitable work of Shanti Mission Harmony Centres and is offered by donation. We encourage people to donate from the heart in accordance with the value the seminar has for you, and you financial means. Parvati Ma is a spiritual master specializing in chakra balancing, energetic healing and embodying the Divine. She is the senior student of Shakti Durga, founder of The Shanti Mission Harmony Centres, whose primary mission is to demonstrate the role of spirit and the benefits of meditation and energetic (light and sound) healing in creating good health and mental wellbeing. 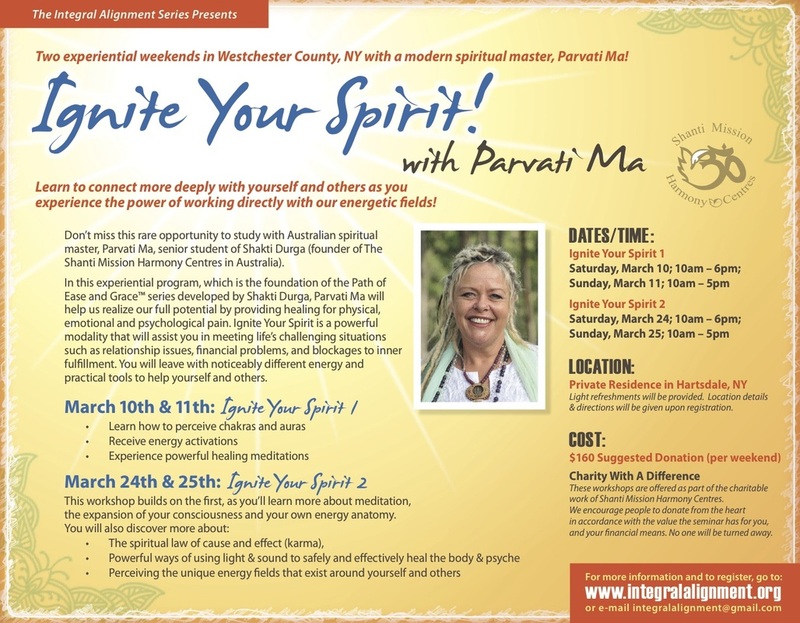 Parvati Ma will be visiting North America to teach Ignite Your Spirit therapy, an energetic healing modality (recognized and accredited by the Energetic healers Association of Australia and the International Association of Complementary Therapy) and the foundation of the Path of Ease and Grace™ seminar series as taught and practiced at The Harmony Centres. Ignite Your Spirit (IYS) Therapy was developed by Shakti Durga to help everyone realize their full potential by helping with physical, emotional and psychological pain, as well as challenging life situations such as relationship issues, financial problems, and blockages to inner fulfillment. It is an experiential, grounded and practical opportunity to learn about your own energy anatomy and that of the world we inhabit. The concept that we have an energy field is now widely discussed but not yet universally understood despite growing research and anecdotal evidence of its role in wellness. Pain (physical as well as mental) as well as stress are held in our energy field, and we help people learn how to remove or minimize it. Your own energy will be noticeably affected as you practice, with continuing changes in the weeks after. Ignite Your Spirit is the foundation seminar of the Path of Ease and Grace™ seminar series. It is an experiential, grounded and practical opportunity to learn about your own energy anatomy and that of the world we inhabit. Your own energy will be noticeably enhanced as you practice, with continuing changes in the weeks after. You will also be shown simple energy techniques as supplementary first aid, to assist with other medical intervention and advice – a must for every parent, guardian, teacher and health worker. Parvati Ma is an integral part of Shanti Mission’s public satsang offerings, which are the vehicle Shakti Durga (founder of Shanti Mission) has created to provide “the opportunity for everyone to experience unity consciousness.” Shakti Durga describes Parvati Ma as “ a true force of nature”. Parvati Ma is a charismatic, larger than life personality blessed with a voice that compels you to listen with delight. When Parvati Ma sings it is the clarion call to the Divine. To hear her, your heart too will sing and your spirit will soar with devotion. Parvati Ma was one of the featured vocalists in Sushumna whose 2009 album Kundalini Rising attracted international acclaim for its contemporary take on Kirtan. She is currently working with a team of Shanti Music songwriters to create a body of original songs for her debut solo album.